Last month, I discussed the millage rate as a measure of growth. This month, I want to take just a moment to discuss building permits as another measure on how well our local economy is doing. 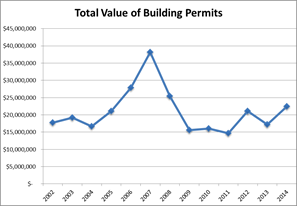 From January-October this year, the number of building permits (counting business and residential together) was the highest in at least 10 years, and the value of those building permits are the highest since 2007. Also, the total value of those permits is the fourth best in the past 10 years. And there is still more to come in November and December permits! 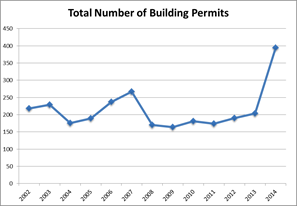 So far in 2014, we have had $22.4 million in 394 building permits. The commercial permits increased this year due to several new developments in the County, including the expansion of the National Wild Turkey Federation and a large rehab of apartments in the County. There were also many small expansions of various businesses within the County. On the residential side, the increase is due to a large number of houses having additions built and the construction of many new houses in the County. I believe the growth we are seeing in 2014 can be attributed to a number of things. First, new people are finding Edgefield County a desirable place to live. And businesses are finding our County is a profitable investment now and in the future as they see population growth coming. It all adds up to another step in our County’s well-being. These two charts are an easy way to visualize the growth in the County. Our Agenda is Your Agenda! As 2015 looms on the horizon, I’d like to know what you think County Council should accomplish next year. – Look at the Strategic Plan to see if there’s something there you think we need to have as a higher priority, a different priority or a new priority. – Look at each Department and think about what they do to determine if you see any priorities there. Of course, what you want to do may not appear anywhere – we want to hear about those ideas, too! I am also interested to know what you think County Council should be doing where you live. You can email me at dcampbell@edgefieldcounty.sc.gov or contact another member of County Council. We appreciate you taking time to give us your opinion! I hope the past year has been a blessing to you! I have enjoyed presenting these monthly updates to you in the spirit of providing a more open, transparent County Government. The more you know the better input you can provide. Have something to say? Please eave your comments below.